Honeywell’s Perfect Fit A6 glove gives workers tactile sensitivity and dexterity for performing precise manual tasks, while also preventing cuts and lacerations. 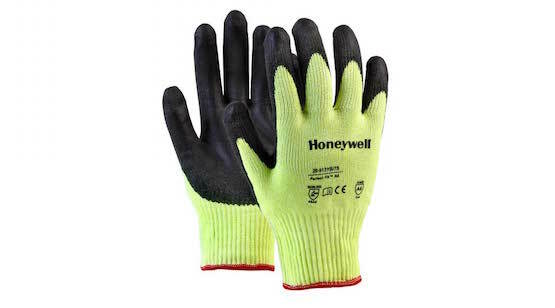 Honeywell has a new line of lightweight, cut-resistant gloves that allow industrial workers to perform delicate tactile work while providing heavy-duty protection against lacerations. Honeywell Perfect Fit A6 glove gives workers tactile sensitivity and dexterity for performing precise manual tasks, such as small parts assembly, while also preventing cuts and lacerations. Cuts and lacerations represent 63 percent of the more than 1 million hand injuries that occur in the workplace yearly, according to the U.S. Bureau of Labor Statistics. “Hand cuts and wounds in the workplace are mostly preventable, yet add up to much lost time and productivity,” said Mary Koszelak, hand protection product manager, Honeywell Industrial Safety. “The Perfect Fit gloves are soft and comfortable, with a durable polyurethane coating, yet take advantage of technological developments in material strength and glove design to provide 360° cut-resistance, and touch-screen compatibility. The new gloves are ANSI A6 cut resistance rated and feature an ultrathin polyurethane palm coating and high-performance cut-resistant blend, seamless knit liner. They are suitable for a wide range of industrial environments including glass handling, metal stamping and fabrication, recycling, carpet trimming, HVAC installation, pulp and paper, oil and gas and automotive manufacturing and repair industries.